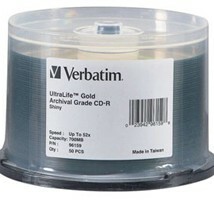 Look to Verbatim UltraLife Gold Archival Grade CD-R media to preserve your family photos and important records as well as critical corporate data. Each disc is manufactured using proprietary unique Dual Reflective Layers (DRL) to maximize both compatibility and longevity. Verbatim’s proprietary dual reflective technology is comprised of a silver layer for broad compatibility and a gold layer for long archival life. The highly reflective silver layer allows the UltraLife CD-R disc to look like a standard silver disc to CD burners. This feature provides a low initial error rate, important for long archival life, and the same drive read/write compatibility as standard silver-only discs. The gold reflective layer is naturally resistant to corrosion. The gold layer overlaps the silver layer and prevents oxygen from coming through the lacquer layer or edge of the disc and corroding the silver. Silver oxidation can be a primary factor which limits the lifetime of CD media. The combination of Verbatim’s revolutionary DRL technology, high quality stamper and superior quality standards enables Verbatim UltraLife archival-grade CD-R discs to deliver new levels in longevity and performance without sacrificing compatibility.